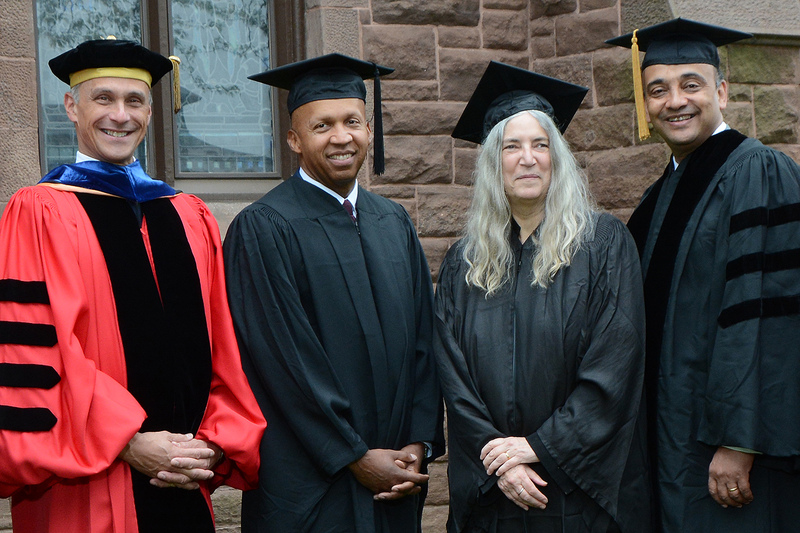 Wesleyan presented honorary doctorates to Bryan Stevenson, Patti Smith and Kwame Anthony Appiah during the University’s 184th Commencement on May 22. 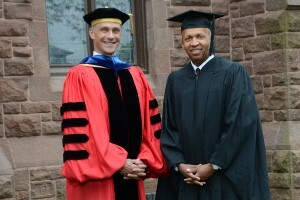 Michael Roth and Bryan Stevenson. Bryan Stevenson is a human rights lawyer who has dedicated his life to fighting racial injustice and discrimination in the criminal justice system. He is executive director of the Equal Justice Initiative (EJI), an Alabama-based group that has won numerous legal challenges on behalf of the poor and incarcerated, including a historic U.S. Supreme Court ruling holding that life-without-parole sentences for children aged 17 or younger are unconstitutional. He founded the Equal Justice Initiative in 1989 to help prisoners on death row, and the scope of its mission has expanded since. Under his leadership, EJI has won a number of major legal challenges—eliminating excessive and unfair sentencing, confronting abuse of the incarcerated and the mentally ill and aiding children prosecuted as adults. He has successfully argued several cases before the U.S. Supreme Court, and he and his staff have won reversals, relief or release for more than 115 wrongly condemned prisoners on death row. Professor Stevenson has initiated major new anti-poverty and anti-discrimination efforts that challenge the legacy of racial inequality in America, including projects to educate communities about slavery, lynching and racial segregation. Professor Stevenson also teaches at the New York University School of Law. He is a 1985 graduate of Harvard, with both a master’s in public policy from the Kennedy School of Government and a J.D. from the Harvard Law School. Among the numerous honors accorded him are a MacArthur Foundation “Genius Grant,” the National Medal of Liberty from the American Civil Liberties Union, and the Olof Palme Prize in Stockholm for international human rights. He was inducted into the American Academy of Arts and Sciences in 2014. He is the author of the bestseller Just Mercy, winner of the 2015 Carnegie Medal for Best Nonfiction and named by Time magazine as one of the 10 Best Books of Nonfiction for 2014. 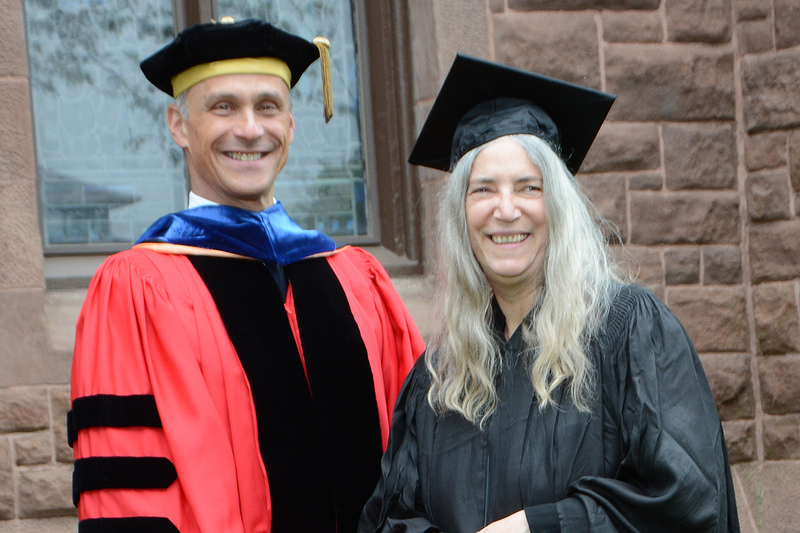 Michael Roth and Patti Smith. Patti Smith is a writer, performer, and visual artist. She gained recognition in the 1970s for her revolutionary mergence of poetry and rock and has recorded 13 albums. Her seminal album Horses (1975) has been inducted into the National Recording Registry by the Library of Congress/National Recording Preservation Board. Her acclaimed memoir, Just Kids, chronicling her relationship with artist Robert Mapplethorpe, was awarded the 2010 National Book Award. Her books include Witt, Babel, Coral Sea, Woolgathering, Auguries of Innocence and the recent M Train. The French Ministry of Culture awarded Smith the prestigious title of Commandeur des Arts et des Lettres, the highest honor awarded to an artist by the French Republic. She was inducted into the Rock and Roll Hall of Fame in 2007 and in 2011 was the recipient of Sweden’s Polar Award, for significant achievements in music. The anthem People Have the Power, written and recorded with her late husband Fred Sonic Smith, is used globally to call for collective unity and social justice. Smith lends her support to many causes, believing it is essential to use one’s creative powers to increase awareness of environmental issues, disease, poverty and human rights violations. Michael Roth and Kwame Anthony Appaih. 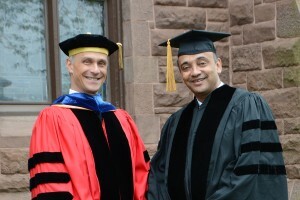 Kwame Anthony Appiah is professor of philosophy and law at New York University, teaching in New York, Abu Dhabi and other NYU Global Centers. He has held a number of other distinguished academic appointments as well, most recently at Princeton in the philosophy department and the University Center for Human Values. He also has taught at Yale, Cornell, Duke, and Harvard universities and has lectured worldwide. Professor Appiah is renowned for his insights into moral theory and practice, racism and identity, cultural differences and political development. His 1992 book, In My Father’s House (Oxford University Press), explores the role of African and African-American intellectuals in shaping contemporary African cultural life and was recognized by the African Studies Association with its Herskovits Award as “the most important scholarly work in African studies published in English.” His vast and wide-ranging scholarly activities earned him Forbes’ designation in 2009 as one of the world’s seven most powerful thinkers. In October 2015, he began to write the weekly Ethicist column for The New York Times Magazine, answering readers’ questions about their ethical quandaries. Professor Appiah holds BA and PhD degrees from Cambridge University. His numerous honors include election to the American Academy of Arts and Sciences and induction into the American Academy of Arts and Letters. President Obama presented him with the National Humanities Medal in 2012.